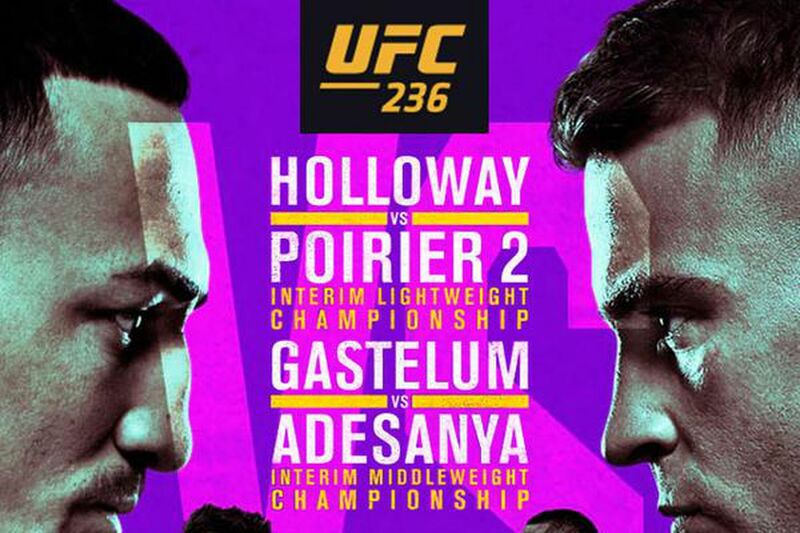 Check out all the ways you can watch UFC 236 right here! Tonight’s UFC 236 is the first UFC pay-per-view to be offered exclusively to ESPN+ subscribers (in the U.S., the ESPN deal does not have international implications.). Atop the card, which is being held at the State Farm Arena in Atlanta, GA, is a rematch between reigning UFC featherweight champion Max Holloway and Dustin Poirier. The fight is for the UFC interim lightweight title. The last time these two squared off it was in the featherweight division at UFC 143, all the way back in 2012. Poirier beat Holloway with a mounted triangle on that night; will he do the same tonight? Or will Holloway become the latest ‘champ champ’ in UFC history. The co-main event sees another interim title up for grabs, this time in the middleweight division. Competing for that temporary strap is Kelvin Gastelum and Israel Adesanya. Also on the pay-per-view card is a light heavyweight bout between Eryk Anders and Khalil Rountree Jr, a welterweight clash between Alan Jouban and Dwight Grant, and a light heavyweight contest between Ovince Saint Preux and Nikita Krylov. The prelim card, which starts at 8PM ET, is headlined by Jalin Turner vs. Matt Frevola (lightweight). Before they tangle Wilson Reis takes on Alexandre Pantoja (flyweight), Max Griffin faces Zelim Imadaev (welterweight), and Boston Salmon fights Khalid Taha (bantamweight). The early prelims (aired on UFC Fight Pass, but also ESPN+ for anyone who purchases the PPV) start at 6:15PM ET. The featured bout on that card is Curtis Millender vs. Belal Muhammad in the welterweight division. Before that happens bantamweights Montel Jackson and Andre Soukhamthath go at it. And before them Lauren Miller meets Poliana Botelho in the women’s flyweight division. The first fight of the night is Brandon Davis vs. Randy Costa in the bantamweight division. If you’re going to be in Atlanta, you can get your UFC 236 online here. For U.S. residents the UFC 236 pay-per-view is exclusively available for purchase (for $59.99) on the streaming service ESPN+. They PPV begins at 10:00PM ET/7:00PM PT. For international viewers the PPV card can be purchased online through UFC.tv or UFC Fight Pass. Non-U.S. residents can also purchase the PPV on the UFC’s official YouTube channel. The early prelim card begins at 6:15PM ET/3:15PM PT. For U.S. residents, this content is available on ESPN+. For the rest of the world it is available on Fight Pass. The prelims will air on ESPN and ESPN Deportes in the US (TSN 5 in Canada), beginning at 8:00 PM ET/5:00 PM PT. TV streaming services Apple TV, LG Smart Apps, Amazon FireTV, and Samsung Apps offer the UFC.TV app, will give you access to UFC.TV where you can order the PPV (if you are not in the U.S.). Outside the U.S. the PPV is also available for purchase through Xbox Live and PlayStation Events (through their dedicated gaming consoles). Non U.S. residents with Android or Apple devices can watch the UFC 236 PPV on apps available at the Google Play and iTunes stores (purchase of the PPV is required). If you feel like going out, you can watch UFC 236 at the following bars and/or restaurants. If you do go out, don’t forget to tweet us picture @BloodyElbow of you and your crew enjoying the show!